Born For Geekdom: Bill and Ted Ride AGAIN! Bill and Ted Ride AGAIN! 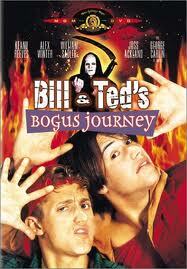 A few nights ago, I asked my husband if we could rent Bill and Ted's Bogus Journey. To which, of course, he said yes. Not that I need to ask permission. I just wanted to know if he'd watch with me. I've also been walking around humming, "God Gave Rock and Roll To You" all week. I loved the Bill and Ted movies when I was a kid. I love them now. But I must confess, the ending of Bogus Journey struck a chord with my young, Star Trek influenced, utopian-dreaming heart. A world of peace and harmony brought on by rock and roll? I liked it. Plus, even back then I knew they filmed in some locations where Star Trek: TOS was filmed. I always obsessed over movies where the losers became the heroes. Imagine that. Plus... I kind of thought the Reaper was cute. I KNOW! I know. Maybe it was an early jones for the artsy films of Ingmar Bergman? A sick fascination with the concept of my own mortality, perhaps? 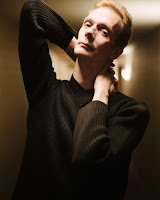 A pre-Conan O'Brien love of pale-skinned Scandinavian men? Maybe it's a question best left unanswered. The point is, I think about this movie too often for a grown-up. So you can bet I got pretty excited when I stumbled upon the news today that there will be ANOTHER Bill and Ted sequel. Or so they say. I have my doubts. And fears. But I choose cautious optimism for the time being. Check the article on DEATH AND TAXES here. Where do you think Bill and Ted will go next?